Peering through the glass at a mannequin's veined hands, sparkling eyes and eerie smile, the small crowd gathered outside a store in northern Mexico tries to settle a macabre riddle beguiling many. Is the tall, slender bridal figure in the window a richly detailed shop's dummy or, as a local legend says, the decades-old embalmed corpse of the former store owner's daughter? 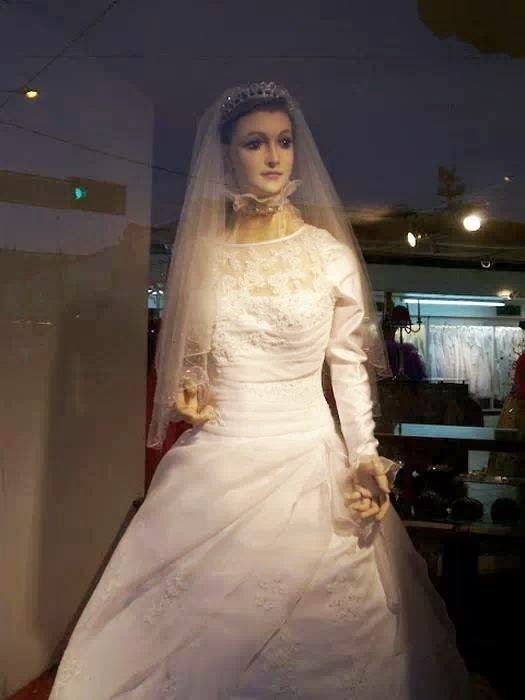 The haunting figure known as 'La Pascualita,' or 'Little Pascuala' first appeared 75 years ago in the window of the bridal gown store in the city of Chihuahua. Since then, the striking realism of the dummy has spawned supernatural tales and reports of a miracle, and even inspired a foot-stomping accordion ballad played on local radio. The figure has drawn a stream of people from across the desert state of Chihuahua over the past eight decades, and is now attracting curious visitors from South America, the United States and Europe, the owners of the La Popular store say. As cars and trucks rumble by the shop on a busy city street, the entranced visitors smudge their noses up against the store window and try to decide for themselves if it's a corpse. "She looks good for all the years that she's been here," Yolanda Robles, who trekked to the shop out of curiosity from Phoenix, Arizona, said as she studied the rosary-clutching figurine. "There are just so many details, like her hair and the nails on her hand, that it just has to be true," she added. Through the years the story has bloomed into a tale with all the rich characteristics of magic realist fiction. It all began on March 25, 1930, when the dummy was first placed in the store front window. Dressed in a spring-season bridal gown, the figure immediately gripped the attention of passers by with its disquieting, wide-set glass eyes, real hair and blushing skin tones. Pascualita is unique among other shop mannequins in the sleepy backwater state capital. Rapt locals soon began to notice a striking resemblance to the shop's then owner, Pascuala Esparza. 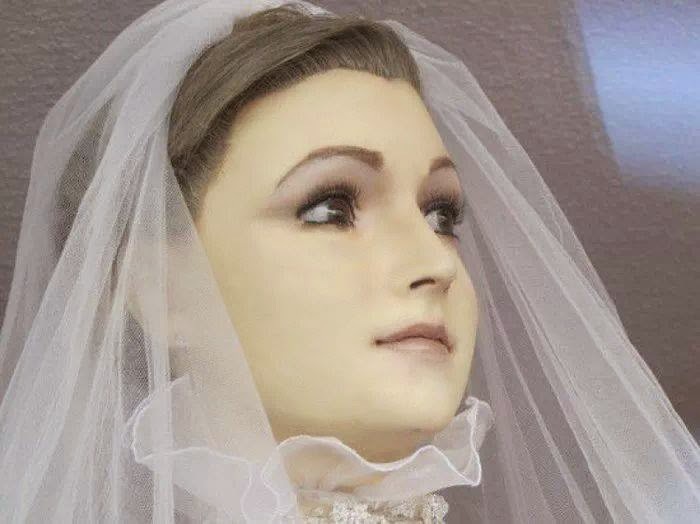 A rumor quickly spread that the figure was not a dummy, but her daughter who, it was said, died from the bite of a Black Widow spider on her wedding day. "She started to receive abusive phone calls from angry citizens who accused her of embalming her daughter," the store's present owner Mario Gonzalez said in his office above the wood-paneled shop floor. "She decided to issue a formal denial through a public notary in the city, but by then it was too late. Nobody believed her and the name 'Pascualita' stuck," he added. The name of the daughter, if Esparza ever had one, became lost in time. Down the years, the tale has been embellished with claims of supernatural happenings, including visits by a love-sick French magician who is said to bring the dummy magically to life at night, and take her out on the town. Others say that her gaze follows them around the store, or that she shifts positions at night in the darkened shop window to the surprise of passers by. Spooked by the tales, several jittery shop workers say they dread being the last to leave the store in the evening, and some of them refuse to change the dummy's outfits. Indeed, twice a week her outfits are changed, always using the more classic bridal styles that Gonzalez and his staff consider more appropriate and dignified. The changing is done - perhaps a bit theatrically - behind curtains put up in the shop window to preserve the dummy's modesty. "Every time I go near Pascualita my hands break out in a sweat," shopworker Sonia Burciaga said. 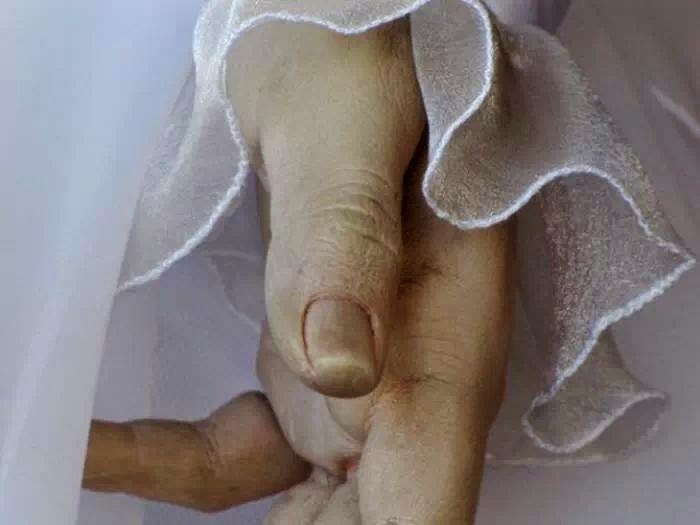 "Her hands are very realistic and she even has varicose veins on her legs. I believe she's a real person." Among those to visit the bride have been popular television figures such as Mario Kreutzberger, better known as 'Don Francisco', whose syndicated show has stirred up interest in the figure throughout Latin America. As more visitors come to the shop each year, Gonzalez says he is thinking of getting a visitors' book and even opening a small museum to Pascualita. But asked to settle once and for all whether she is a dummy or a corpse, he just smiles and shakes his head. "Is it true? A lot of people believe it is, but I really couldn't say."